Are You Ready to Free the Woman Within? Have you spent a ton of money on clothes, makeup, hair removal, and hormones – yet still aren’t as feminine as you want to be? Are you struggling to overcome the masculine habits that prevent you from passing or blending in as a woman? 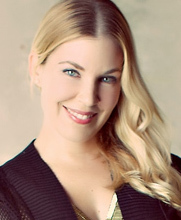 Do you have serious doubts about your ability to be accepted as the woman you want to be? If you answered “yes” to any of these questions, then you probably realize that transforming yourself on a strictly physical level doesn’t work. To truly become the woman you want to be, it’s not enough to just look the part. It’s not even enough to act the part. You need to think and feel like a woman, from the inside out. And the most powerful tool you can use to free the woman within? Your MIND. A woman’s mannerisms and behavior are controlled by her thoughts and emotions. That’s why trying to “act” like a woman doesn’t work. Your every action and reaction needs to reflect your inner femininity. No matter how feminine you might feel, you are still being influenced by your masculine past. You probably aren’t even aware of all the subconscious masculine habits you picked up through your male upbringing. Confidence is the key to passing or blending in as a woman. Even the slightest insecurity will show through in your body language and will attract the wrong kind of attention. What if, instead of struggling to “act” like a woman, you could effortlessly move through the world as your true femme self? And what if, instead of being sabotaged by your doubts and fears, you could have total confidence in yourself as a woman? You CAN – by accessing the power of your mind. Hypnosis is the single most powerful tool I’ve discovered to help you achieve your feminine goals. But what exactly is hypnosis and how does it work? Hypnosis is a state of focused relaxation that allows you to get in touch with your subconscious mind. Your subconscious mind is the deeper part of your mind that controls your self-image, beliefs, habits, behaviors, and unconscious body functions (like your breathing, digestion, and heart rate). Think of it as the operating system for your mind and body. Reprogram your subconscious mind to change unwanted masculine habits and behaviors. Become much more skilled and natural in all aspects of your feminine presentation. Release any fear, doubt, or guilt you have about expressing yourself as a woman. By now, you’re probably wondering who I am and why I claim to know so much about this topic. My name is Lucille Sorella. I’m an image stylist and femininity advisor. My unique specialty is helping crossdressers and MTF transgender women improve their feminine images. Although fashion and beauty are huge passions of mine (I started my career in the fashion industry in NYC), I’ve always been a seeker of “inner beauty” too. I’ve been exploring hypnosis, meditation, and other techniques for freeing my mind for the past 15 years. In fact, these tools had such a profound effect on my life that I became a Certified Hypnotherapist in 2011. Since everything begins with the mind, I realized that hypnosis could also enhance the results being achieved through my image transformation programs. The Unleash Your Inner Woman Program consists of 5 downloadable MP3 hypnosis sessions (20-24 minutes each) created to help you free the woman within – physically, mentally, and emotionally. 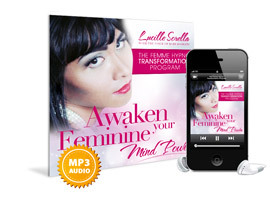 The Awaken Your Feminine Mind Power session sets the stage for your feminine transformation. 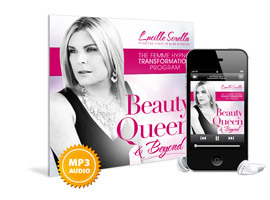 You’ll gain the tools to take control of your “masculine mind” and express yourself as a woman – inside and out. Reprogram your subconscious mind to feminize your thoughts, actions, and behaviors. Transform unwanted masculine habits so you can effortlessly present yourself as a woman. Connect with your Ideal Feminine Self and discover new ways to express her in your daily life. Feel much more confident and secure about expressing yourself as a woman. The Flawless Feminine Image session will help you master the most important elements of your feminine image, including: hair, makeup, clothes, voice, movement, and body language. If you’ve ever struggled with your image, this session will help you feel more skilled and natural in presenting yourself as a woman. Direct your subconscious mind to emulate the behavior of the most elegant cisgender women you observe in your daily life. Let go of previously uncontrollable masculine mannerisms. Sound more feminine when you speak and communicate as a woman. Become more skilled in doing your makeup, styling your hair, and in putting fashionable and flattering outfits together. The Feminizing Your Past, Present and Future session will help you create a new past in which you were born female and developed feminine qualities throughout your life. You’ll let go of fear and guilt in the present and design the future life you want to be living. 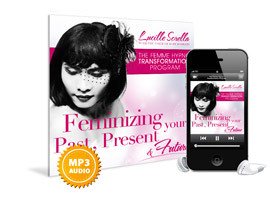 Develop the essential feminine qualities you needed from each stage in your past development. Transform the beliefs that keep you stuck in a battle between your masculine and feminine sides. Let go of self-doubt and gain complete confidence in yourself as a woman. Create a blueprint for your desired feminine future. The Beauty Queen and Beyond session will take you on a journey where you unveil your femme self to the world in a glamorous beauty pageant. You’ll go beyond simply looking good, to experiencing yourself as a total woman in mind, body, and spirit. 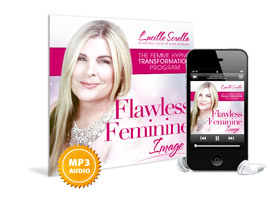 Effortlessly transform your self image so you can start living as your Ideal Feminine Self. Improve and automate all aspects of your feminine presentation. Embody the inner qualities you need to be a truly beautiful woman. Learn how to automatically trigger feelings of beauty, femininity, and confidence in your daily life. 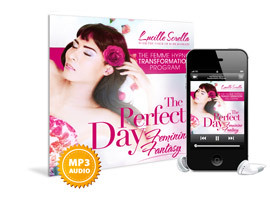 The Perfect Day Feminine Fantasy session is a guided journey that will allow you to experience life as a woman. It’s a great way to enjoy your femininity in “virtual reality” if you can’t or don’t want to go out in public as a woman. Or treat it as a dress rehearsal for your next outing! This session also contains suggestions to help you become more feminine in your daily life. Take a break from your daily life and enjoy the fantasy of living your ideal feminine reality. Retrain your brain to feel more natural and feminine in real life situations. Step into the “virtual reality” of a gorgeous woman who is admired and desired by others. Let go of any last traces of masculinity that have been holding you back from expressing your true femme self. As an added bonus for ordering today, you’ll also get this exclusive bonus session – absolutely free! 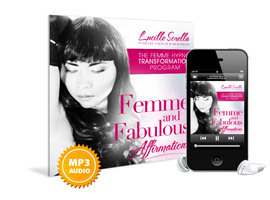 The Femme and Fabulous Affirmations BONUS SESSION contains 140 “femininity affirmations” created to reinforce the suggestions in the hypnosis sessions. Simply listen to the audio while you relax or as you go about your day. Your thoughts and beliefs will naturally transform as your mind absorbs these affirmations! As powerful as hypnosis is, there’s a lot of misunderstanding surrounding it. Before I go on about the benefits of The Unleash Your Inner Woman Program, I’d like to clear up some common myths about hypnosis. Myth #1: Hypnosis can make you do things against your will. This is absolutely NOT true. During hypnosis, you are fully alert and in control at all times. Hypnosis can influence your thinking, but it cannot control it. Myth #2: You won’t be able to revert back to your male self (if you so desire). False. You are in control at all times and can immediately revert back to a masculine state if you so choose. However, since I recognize that crossdressers and transgender/transsexual woman have different needs, I created two different versions of the program. One version of The Unleash Your Inner Woman Program includes suggestions about reverting back to your male self and the other does not. You can use whichever version is most appropriate for you. Myth #3: Only certain people can be hypnotized. While it’s true that some people go into trance more easily, anybody who desires to be hypnotized can be. The good news is that you do not have to go into a deep trance in order for hypnosis to be effective. Myth #4: Hypnosis does ALL the work for you. As powerful as hypnosis is, you still have to take action in the real world to see results. Hypnosis is not a substitute for hormone therapy, surgery, or good old-fashioned feminization training. However, you’ll be amazed what can happen in the “real world” when you align your mind with your feminine desires. Listen to just one hypnosis session per day and I guarantee you will SUPERCHARGE your feminine transformation in just a few short weeks! You will feel more feminine from the inside out. You will undo the masculine programming that has prevented you from fully expressing yourself as a woman. You will feel more confident about expressing yourself as a woman. You will incorporate more feminine actions and behaviors into your daily life. You will have the courage to express your femininity in new ways. You will experience more feminine thought patterns. Your posture, body language, and movements will become more feminine. You will communicate in a more feminine way – both in the words that you use and in the way that you speak. You will become more skilled in all aspects of presenting yourself as a woman. You will rewrite your past so you feel as though you have been a woman for your entire life. You will learn to love and appreciate yourself as you are NOW. You will be more motivated to improve all aspects of your feminine image. You will feel lighter and happier as you let go of fear and guilt around your femininity. You will achieve the perfect balance of masculine/feminine energy that you desire. The great news is that you may notice a change in your self-image immediately! Other changes take more time. Generally speaking, it takes 21 days to establish new habits. You will continue to improve in all areas with regular use of The Unleash Your Inner Woman Program. Thanks for the compassion and expertise expressed in your program. The session scripts express sublime understanding of transgender issues. Your love and compassion is evident throughout. The sessions are fantastic. I feel fantastic! Your program is an absolute blessing to me. I’ve been full-time for 10 months. The difference in my self-esteem is tremendous. I feel remarkably happy as a result. Another great bonus is catching the suggestions unfolding naturally in my behavior. I am ecstatic about the results. I have never been happier about being a transgendered person in my entire life. I will heartily recommend this program to every trans-woman i know. If you’re like most crossdressers and transgender women, you’ve probably spent thousands of dollars on clothes, shoes, makeup, wigs, breast forms, hormones, and more. Instead, I’ll show you how to take control of your most powerful feminizing tool: YOUR MIND. For only $87, you will get instant access to the complete Unleash Your Inner Woman Program so you can transform yourself into a woman on ALL levels – physical, mental, and emotional. Click here to place your order now for only $87.00. Note: Your billing statement will show a charge from “CLKBANK*COM” and the nature of your purchase will not be revealed. Every order is 100% confidential. 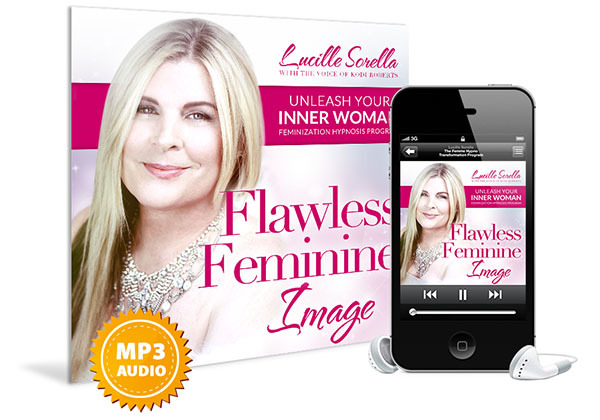 As soon as you’ve completed your order, you will be redirected to a download page where you can immediately access The Unleash Your Inner Woman Program (including 5 hypnosis sessions and one bonus affirmations session) in MP3 format. If you have any questions or need tech support after purchasing, simply send us an email and we will respond within 12-24 hours during business days. I consider it an honor and a privilege to be part of your feminine journey. I know you have a choice about how you spend your money and I want you to be absolutely delighted with your purchase. Download the program to your computer and test these techniques risk-free for 60 days. If FOR ANY REASON AT ALL you decide that this isn’t for you, just let me know and I will send you a no-questions-asked, 100% refund within 1 business day. So are you ready? I can’t wait to show you what’s possible when you unlock the feminizing power of your mind. Download your copy now and let’s get started! P.S. Remember, with my 100% money back guarantee, there’s no risk on your part. You have nothing to lose by trying The Unleash Your Inner Woman Program and the sooner you get started, the sooner you’ll be on your way to truly embodying the woman within. Please call me Rachel. I use your hypnosis program often and it has really helped my confidence and improved how I see myself. I now shop for makeup, clothes, shoes; everything a woman needs with confidence in guy mode or dressed (dressed is more fun, but not always convenient – like on lunch break!) without fear!! I have come out to salespeople in many cases to be sure everyone is comfortable and many will ‘stand guard’ while I try something on in guy mode. I also find it easier to visualize my real self than before I tried the program, even without my wig and makeup. It is very liberating!! 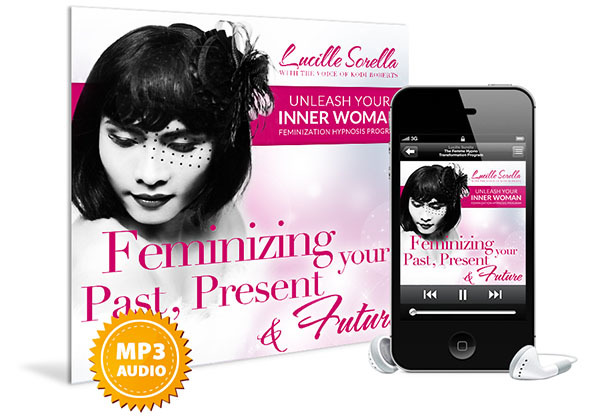 NOTE: The Unleash Your Inner Woman Program consists of a series of 6 downloadable MP3 audio files. No physical products will be shipped. After you order, you will get INSTANT ACCESS to download the MP3s, which can be played on an iPod, computer media player, or any MP3 player.